Here comes charter yacht MOONRAKER, an awe-inspiring modern Mangusta 165E representing the flagship of the Italian Overmarine Group. With a maximum speed beyond 40 knots one could rather think it's about airspeed. Thrilling and exciting MOONRAKER Mangusta yacht for charter has everything and promises to be one of the most compelling fast motor yachts on the market at all. Boasting a Stefano Righini exterior design she comes with the best in house naval architecture and interior design the Mangusta Overmarine shipyard currently has to offer. The interior has a charming and welcoming color palette. With more than 250 textures and fine materials an atmosphere has been created guests can indulge themselves in tranquil and modern airy surroundings. Sophisticated materials like exquisite stones, finest woods, mother of pearl and sophisticated leather, which include Aston Martin leather chairs, have been used just to name a few of them. 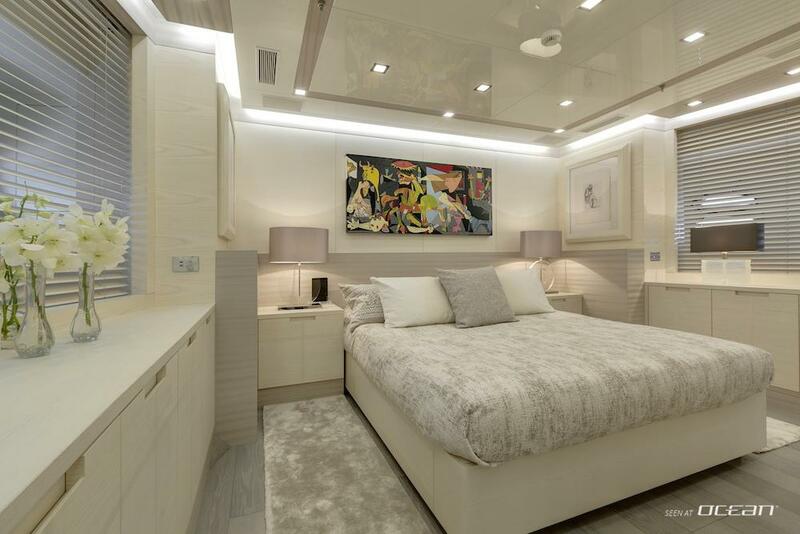 Layoutwise M/Y MOONRAKER for charter comes with four spacious double cabins accommodating up to 10 guests including a master stateroom, a VIP suite and two guest cabins. The master suite features full beam size and impressive ceilings of 2.35 meters height and comes with his and hers bathroom facilities equipped with a large bathtub and rainfall aromatherapy rainfall shower. 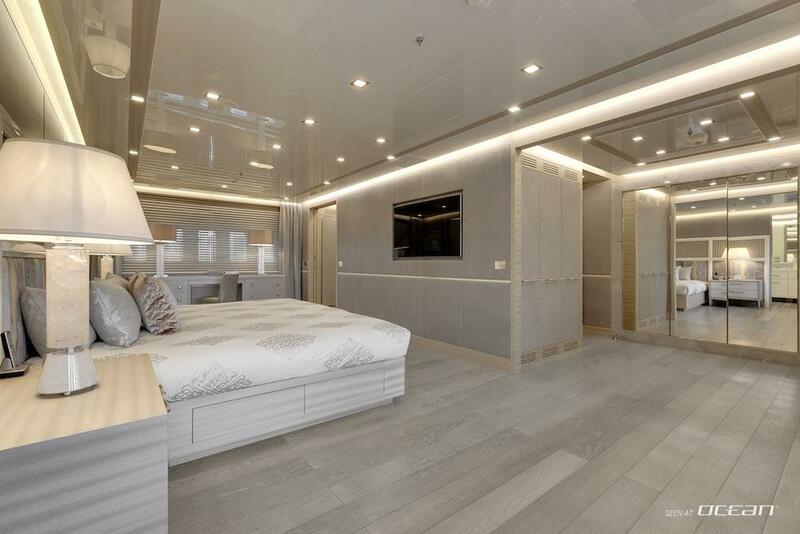 A separate dressing area completes the luxury with latest state-of-the art audio-visual entertainment systems and ample space available in and around the master stateroom. 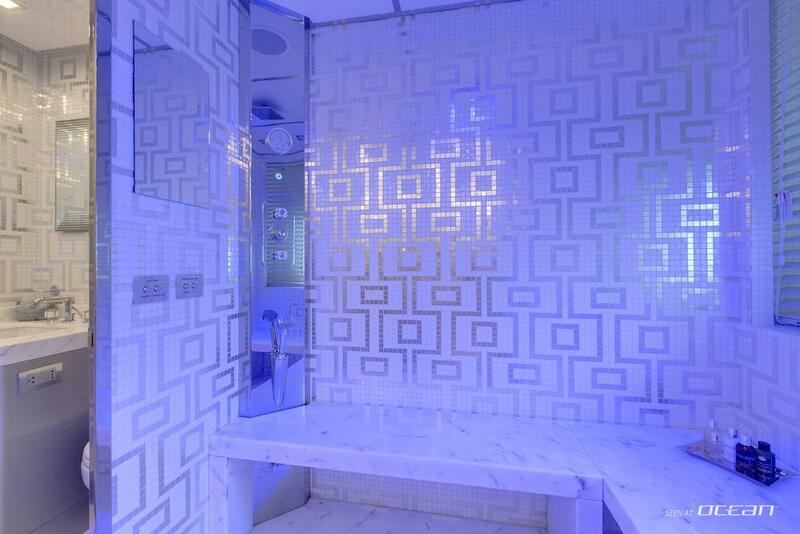 What is a superyacht without amenities? Charter yacht MOONRAKER has them all! 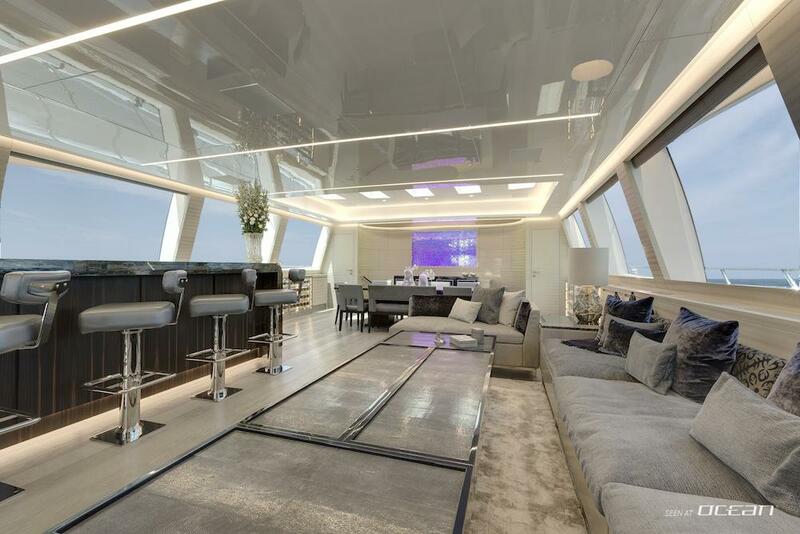 Boasting with a well equipped gym and a cinema room which can be found on the lower deck, this Mangusta 165E for hire knocks your socks off with her impressive modern and airy creamy main salon. With nice decorations and fancy cushions and blankets, nice and ample seating lounges with large dining area and a splendid large bar emphasizing this social area, the salon comes with features like lift-up LED-TV and built-in fridges with pop-up liquor cabinet. 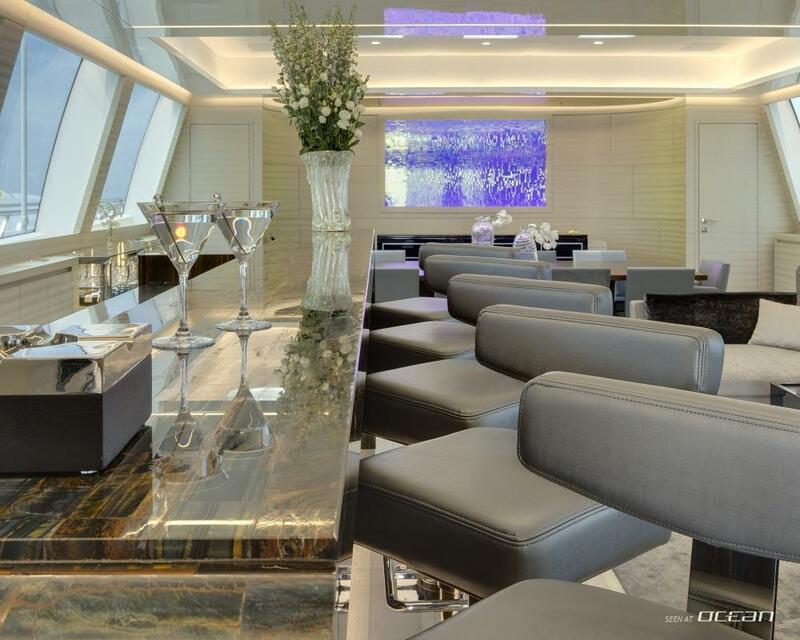 Suffused with natural light thanks to her large oversized windows on both sides guest can enjoy panoramic sea views in the salon and enjoy a glass of wine out of the provided cabinet humidor, wine cooler & wine cabinets holding more than 100 bottles of the finest sorts. 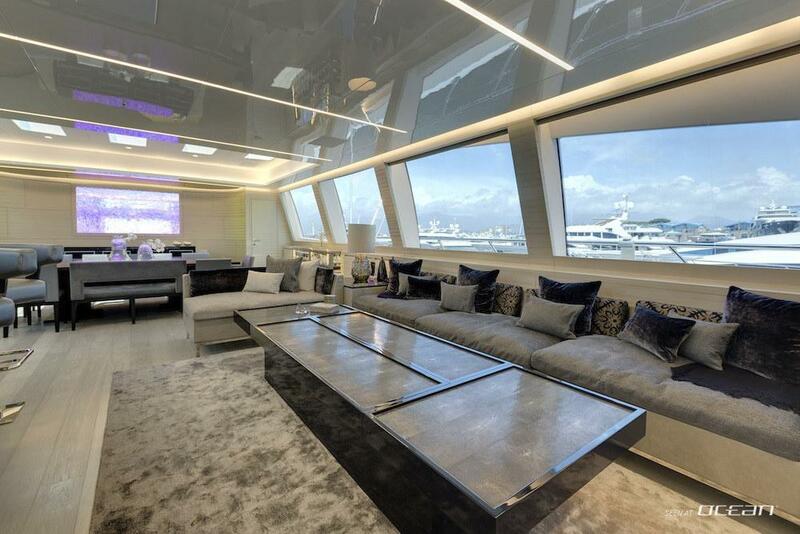 Further on the main deck aft, an additional lounge features another dinging area housing two back-to-back pop-up smart TVs measuring 55" screen size being an ideal room for enjoying movies and sport games if guests should not prefer the cinema or main salon. 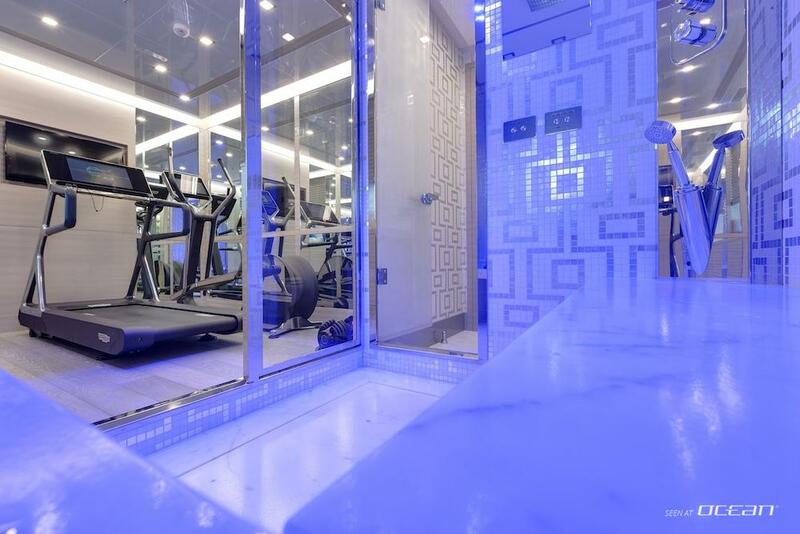 Elsewhere on the lower deck the well equipped gym comes with a Hammam/steam shower and en-suite bathroom facilities and a massage table for which a massage therapist can be arranged during the cruising holidays. 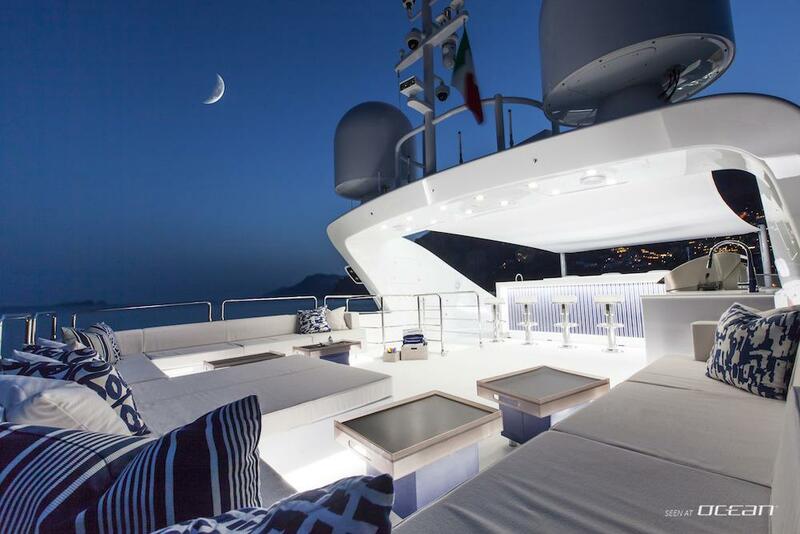 Motor yacht MOONRAKER for charter also stands for vast exterior spaces and open air entertainment. 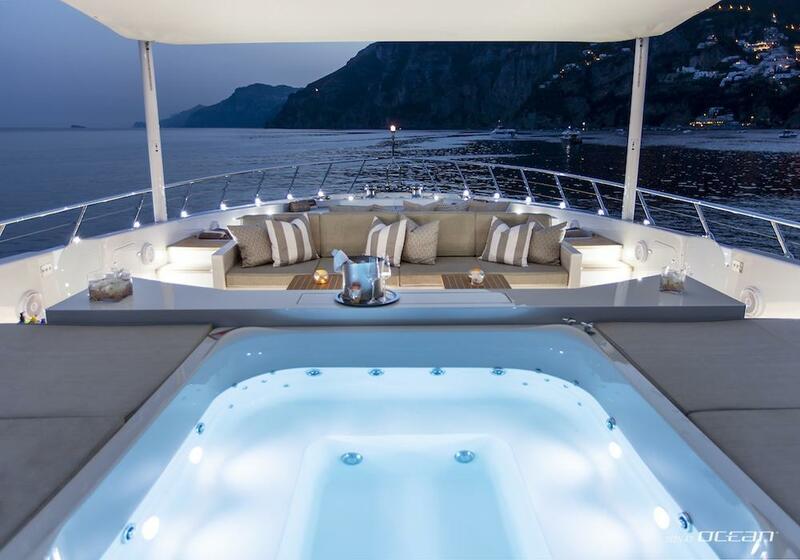 Continuing on the main deck forward a Jacuzzi will wait for the guests surrounded by large Nikki Beach-style sunpads. This chic area ideal for relaxing and sunbathing also features entertainment amenities like another back-to-back pop-up TV and a third alfresco dinging area with optional awning comfortable for up to 8 guests. 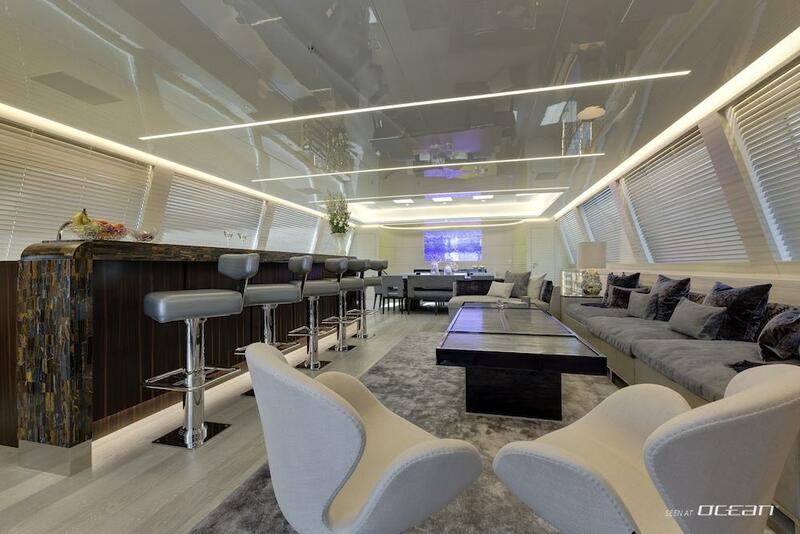 Want a BBQ-experience on board of MOONRAKER motor yacht? You got it! 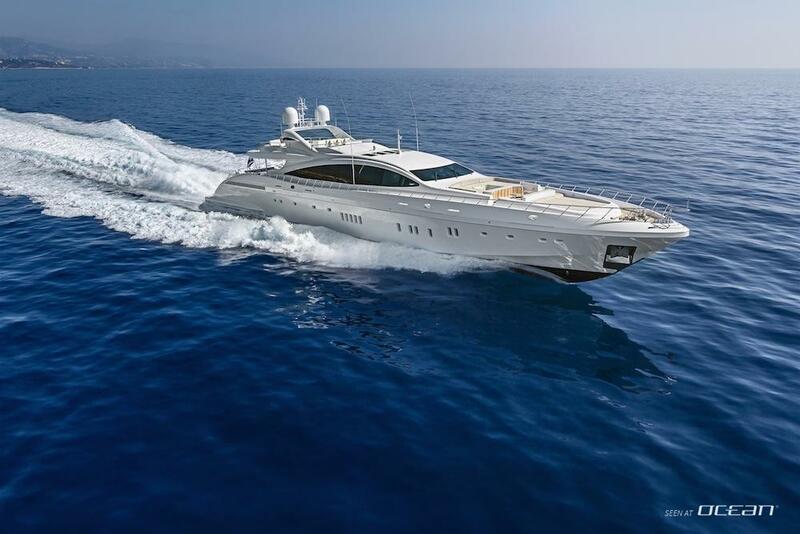 Mangusta 165E MOONRAKER for charter is the incarnation of fun, luxury and speed with a magnificent crew service. An armada of water toys with wave runners and inflatable towables is waiting to keep guests entertained on sea and even below with an extensive scuba diving gear for all guests on board. Putting the ingredients of luxury, modern and stylish interior/exterior, professional crew, fun with water toys and all the amenities on board together, a Mangusta flagship cannot be completed without remarkable performances. 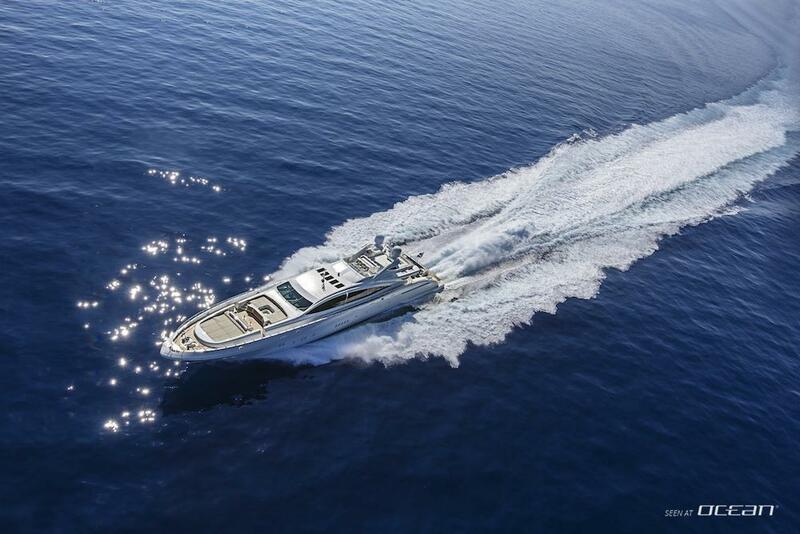 The ne plus ultra is speed thanks to its powerful 3 MTU engines and almost 14.000 horse power in total! Fast island hopping in the Bahamas and Caribbean covering a lot of distance with a fast cruising speed above 30 knots will be possible, as well as exploring seduced and romantic bays with her shallow draft of only 1.70 meters. 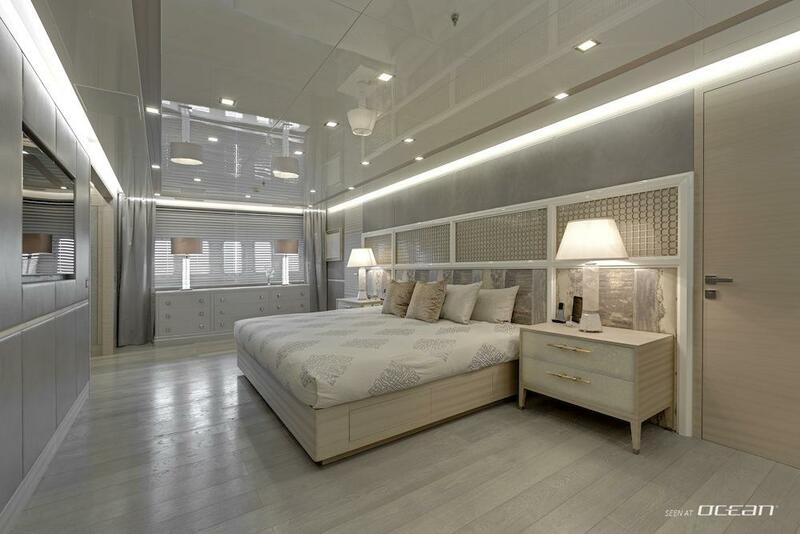 And once cruising speeds beyond 30 knots are too much for hairstyles on board and dry mouths cannot catch up with drinks, with half of the cruising speed at 14-16 knots guests will be able to enjoy exterior amenities and deck space underway appreciating a 50% savings in fuel burn. Come on board of Mangusta 165E MOONRAKER motor yacht for charter and add that special touch of luxury to your holiday now! This superyacht with its crew is ready to whisk you away to escape cold northern hemisphere winters and will remain in the Bahamas for summer 2015. 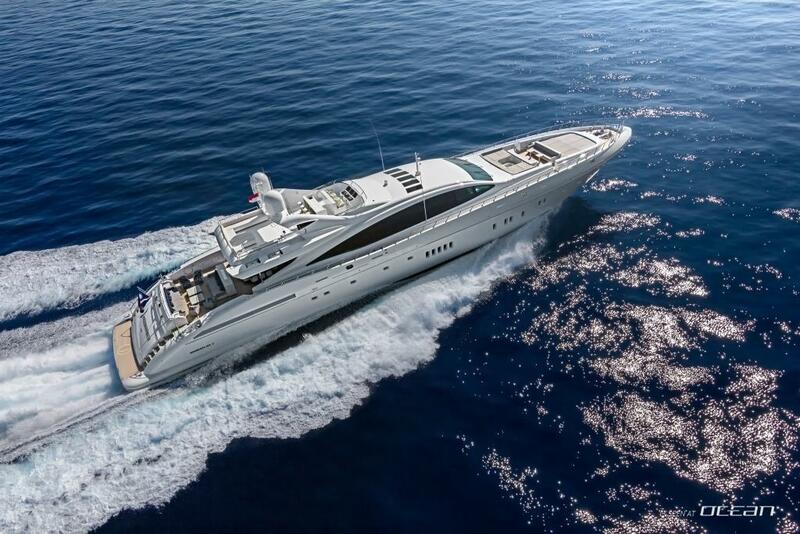 Charter yacht MOONRAKER Mangusta 165E offers special summer rates in the Bahamas and Caribbean. Please inquire more details! Gym equipment: Technogym elliptical trainer, Technogym treadmill, Bowflex SelecTech adjustable dumbbells, AB Carver and range of floor/core training devices. 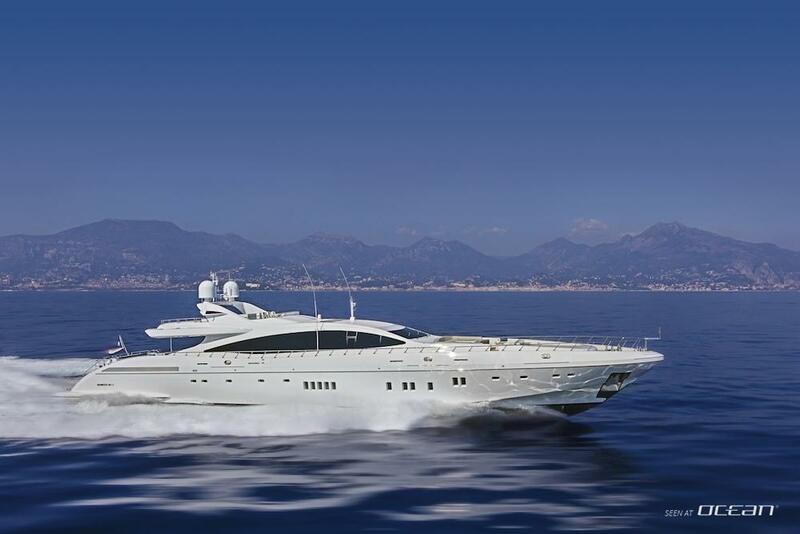 Mangusta 165E MOONRAKER yacht for charter has a gym with adjacent en-suite bathroom facilities equipped with emotional shower/steam room and massage table whereby an additional massage therapist can be arranged on request. 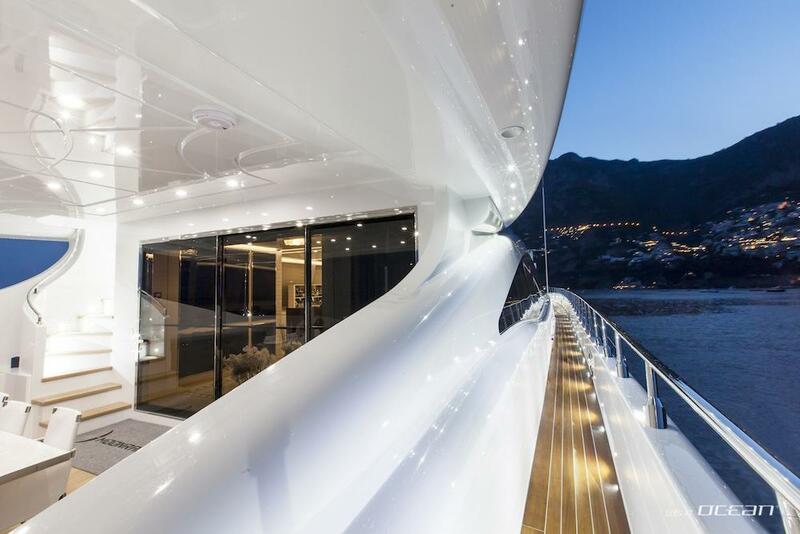 The yacht features also a fold-out diving board from main deck and represents the currently best Mangusta charter yacht on the market at all.